Evanston, IL. The Chicago Force struggled early in this game but stormed out of the locker room and took complete command in the first minutes of the second half. The Slam never recovered from that furious onslaught and absorbed a 57-14 pounding in their cross-conference rivalry. The Force offense had some early issues with protection on the left side of the line, which limited the effectiveness of the passing game. Ultimately, Chicago threw for just 50 passing yards, with numerous well-delivered passes being dropped. As a result, the staff intends to re-evaluate its receiving corps this week. Fortunately, the running game continued its dominance as it amassed 307 yards on 40 carries. 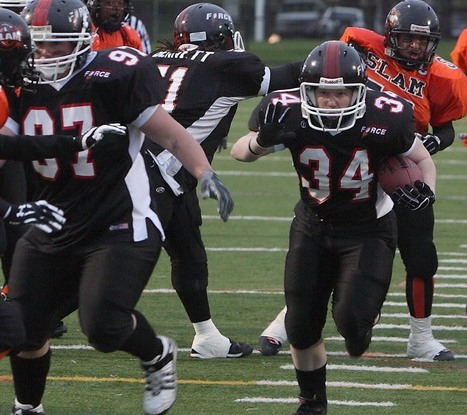 Melissa Smith powered the running game with 145 yards and 4 TD's on just 13 carries. She also ran in four 2 point conversion attempts. RB Brandy Hatcher kept the Slam off balance, knifing through their defense for 74 yards on 8 carries. And versatile WR/QB Albi Zhubi was named Offensive Game Day MVP for her efforts: 60 rushing yards on 4 carries, a 23 yard TD reception and solid punt and kickoff returns. Another huge run was negated by a penalty. Zhubi had a break-out rushing game the previous week and seems to be hitting her stride. For the second game in a row, the Force defense put points on the board. Some second half adjustments forced the Slam into costly turnovers early in the third quarter. Darcy Leslie was named the Defensive Game Day MVP for her impressive work: 9 tackles, 3 for a loss, one sack, and a fumble recovery that she returned 30 yards for a touchdown. Sami Scurto also had a big game with 8 tackles, 2 for a loss, a forced fumble and an interception that she returned 39 yards for a touchdown. The Force are now 4-0 at the season's mid-point but Head Coach John Konecki is not satisfied with his team's performance. "Most teams would be happy with a 57-14 victory. Obviously, we're raising the bar with our sights set on a trip to the national championship in Pittsburgh. We have to improve in several areas if we want to avoid a repeat of our premature exit from last year's playoffs. We attribute last year's loss to the Boston Militia in large part to the misplaced focus the team developed as the season progressed and the belief that we were as good as our press clippings." Next up for the Force is the West Michigan Mayhem this Saturday May 12th at home in an important inter-division game with playoff implications.